Last season was one of the toughest any Rangers fan has had to endure. Playing in the Scottish Third Division started an exciting journey for Rangers fans, visiting grounds and towns they never had to before. Getting back to the top as quickly as possible was – and is still – the main objective but many Rangers fans felt that if they could help clubs who didn't kick Rangers when the club was at its lowest, then that was an added bonus. Rangers fans were united as one as the club began this journey. All too quickly, the enthusiasm began to fade and with that, the unity of the fans began to end. Arguments between different fans group began and slowly but surely, the unity was gone. The main reason for the enthusiasm going and the unity falling apart was team performances and the attitude of some players at the club. Ally McCoist's team regularly played some very poor football during the course of the season and you could rarely leave Ibrox after a game saying you were entertained. The signings that McCoist has made so far have all been good. The SFL's top scorer last season has came into the club at the age of 22. Nicky Clark is following in the footsteps of his dad – Sandy – in joining the light blues. He's the most exciting of the signings and could form a good partnership with another new striker, Jon Daly. A lot of people might not agree with this signing due to his age, but he could be the perfect signing for Rangers this summer. He's someone who isn't afraid to put his head where it hurts and is also a capable footballer. Nicky Law is another exciting signing, one of Motherwell's best players last season and already in pre-season looks to have started the makings of a good partnership with Lewis Macleod. Cammy Bell comes in as Neil Alexander's replacement on much lower wages and is much younger than the outgoing keeper. Richard Foster, Steven Smith and Arnold Peralta also came in. We don't much about Peralta and he could turn out to be a gem. We know plenty about Foster and Smith after their previous spells at the club and they provide good experience to the youngsters. Some players need to leave and one centre back needs added, but overall the squad is looking good. While the squad looks good on paper, they have to look good on the park. McCoist and a number of players have spoke about how they want to get the ball on the ground and play football. 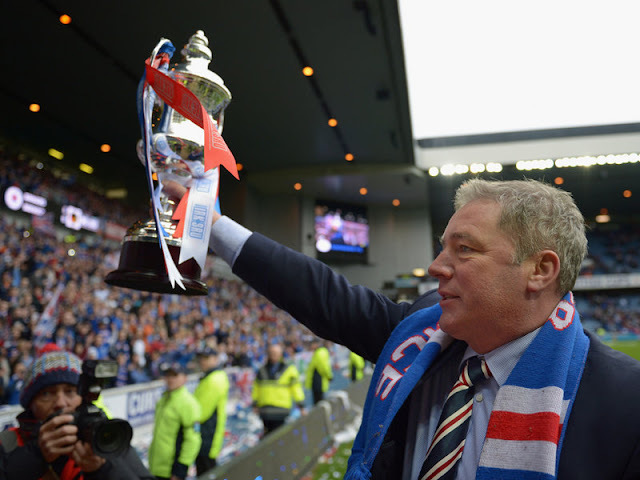 McCoist deserves one last chance to allow this to happen and if pre-season is anything to go by, we should be on our way to doing this. Another major problem of last season was fitness. The excuse of no pre-season last season was used on various occasions and holds some weight. This season, McCoist has brought in Jim Henry as the new head of sport science after Adam Owen left the club to take up a role with David Weir at Sheffield United. By all accounts, Henry is putting the players through a vigorous pre-season and the players have spoken about their better fitness in the pre-season matches commenting on managing to stay fresh in the soaring heat in Bristol at the weekend. Off the park, Rangers don't have enough stability in the boardroom yet. If McCoist went, the club would have none at all. It's fair to say that McCoist has had the most turbulent spell of any manager of this great institution. In his first season, Craig Whyte was the owner and we all know what happened there. Last season, McCoist had six players turn up for pre-season and it wasn't really his team. He just had to get players in. This season, he can finally be judged on performances and whether his signings work or not. I've been one of his biggest critics, but it's time for the players, board and fans to unite behind Mr. McCoist and help Rangers in the next step of The Journey. In the words of Ludovic Lestrelin when he discussed Rangers - “Suffer together, rebuild together, then conquer together”. What would make a good season? Traynor/McCoist: A new Super Ally?